Today I am linking up with The Teaching Trio for my first ever Favorite Things Linky! Over the summer is my time to relax and wind down from the past school year. I also like to think back and reflect on what went well and what areas I need to improve. Each summer I pick a few Professional Development books to read or reread to freshen up and get ready for the upcoming school year and the new amazing kids that will be in my class. Here's my Favorite Summer Reading Professional Development Books! This summer, picking the books was very easy. You may remember this picture I post on Instagram a few weeks ago to kick off my Summer Reading. This was my original plan for summer reading but I had to switch one book out. More about that in a minute. Onto the books! 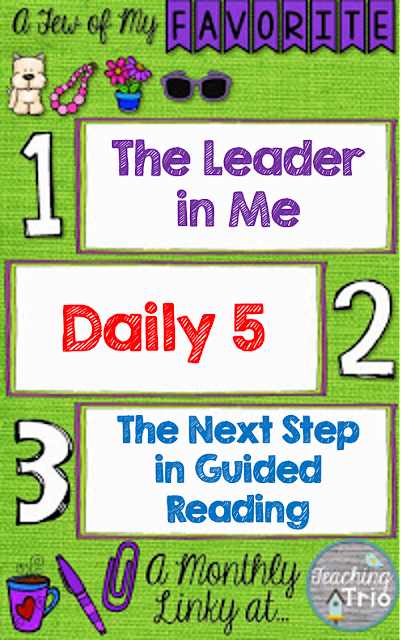 Daily 5 - I read this book last year and it was amazing! It has completely changed how I run my room and the kids are in complete control of their choices and love it! I feel like they have more freedom and so do I. I am also able to differentiate more and that was an area I struggled in before. I still have some kinks that I need to work out for this upcoming school year so I am rereading parts to freshen up and make a few changes for next year. The Next Steps in Guided Reading - Ok, this book is not in the picture above but I have a very good reason for this. I began the summer wanting to read Worksheets Don't Grow Dendrites. I feel like sometimes I use worksheets as fillers and really need to get away from this and use worksheets more effectively when I do use them. However, I was asked to be part of a book study about Guided Reading and of course I could not say no. I love teaching small reading groups and am in the process of getting my Reading Specialist so I am very excited to join this book study! Be on the look out for future posts when the book study goes live on the blog in mid July. Now I am off to get reading and learning to prepare for next year! Head on over to The Teaching Trio to link up with 3 Favorite Things.